The Series 800A Power Purifier takes polluted, fluctuating, and erratic electrical power that exists in all areas today, and purifies it for sensitive electronic equipment. 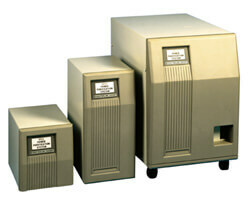 The Series 800A Power Purifier is ideal for commercial power distribution situations. In addition to the problem of electrical power disturbances, there is often the question of how to effectively and efficiently distribute electrical power at a given installation. Typically, a commercial environment (offices, facilities, etc.) is in a state of perpetual change. When computers and peripherals are added, eliminated, or relocated, the power distribution equipment must be capable of adapting to these changing conditions. The Series 800A Power Purifier is also ideal for medical applications requiring an isolated power source with low leakage current to ground characteristics. Controlled Power manufactures a wide range of power quality equipment for regulating, conditioning, isolating, purifying and distributing electrical power. They have maintained leadership in the power conditioning and UPS industry by listening and responding to their customers needs. Controlled Power is committed to manufacturing the highest quality products and providing superior customer support.